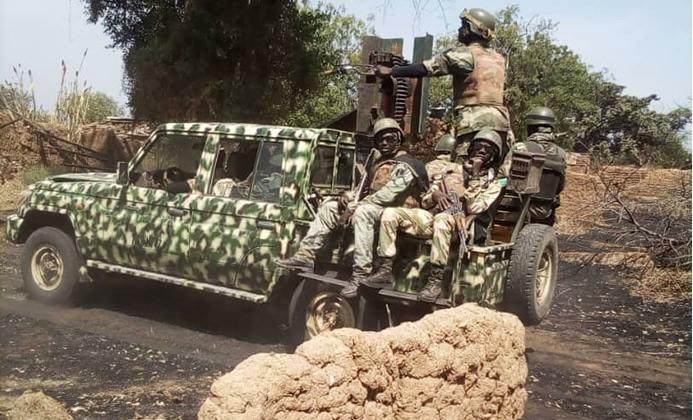 The Nigerian Army on Wednesday said its troops killed 11 Boko Haram members in a fresh attack coordinated by the insurgents at Madagali town, Madagali Local Government Area of Adamawa. Army Public Relations 7 Division, Sector 1 Operation Lafiya Dole, Col. Ado Isa, Deputy Director, in a statement, said the troops also destroyed and recovered high calibre ammunition and equipment from the insurgents. Isa disclosed that the insurgents had on Tuesday evening, invaded the town with five gun trucks, an Armoured Personnel Carrier and an Improvised Explosive Device borne-vehicle. Isa said, “Following the successful neutralisation of scores of the Boko Haram terrorists and recovery of cache of arms and ammunition by the dogged troops of 143 Battalion; 28 Task Force Brigade, Sector 1 Operation Lafiya Dolem recently at Madagali, Adamawa, the battalion has recorded yet another great feat. “The gallant troops once again devastated and clipped the wings of the terrorist group in a fierce encounter which occurred at about 18: 10 p.m. on Tuesday, Feb. 12, 2019.